Denny Hamlin pulled off a strong qualifying run with a 4th place position going into Dover. Now we know that Dover is not usually a strong track for Denny so this is a huge accomplishment in itself. Today during final practice we quickly saw Harvick and the RCR team try to derail Denny’s championship efforts. During practice Harick’s crew was staring Denny down as they were parked right next to each other and giving Denny some smart comments like “good luck today”. Denny immediately knew something was up. Denny went out to pit road and Harvick followed and was riding Denny’s bumper. 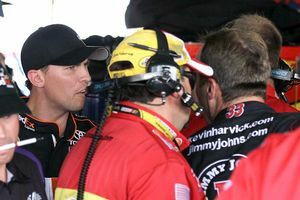 Denny went out onto the track and was trying to let Harvick go by when Harvick gave Denny a hit. 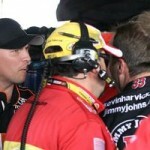 Denny moved over and Harvick went by and tried to cut down on Denny’s nose. What gives Harvick any reason to do this? He needs to mind his own business and focus on his own Championship efforts rather then try to ruin it. Of course Denny did make some comments about the RCR cars with intent of informing the fans about what is really going on. RCR is trying to b.s. the fans into believing that their violation gave them no advantage, but any down force advantage is going to help. No one can blame Denny Hamlin for speaking out either. He was clearly beat by a car that was cheating. Dennys team worked their butts off to make fast race cars with out the down force, while RCR cut corners to try and get there faster. So of course Denny is going to be upset, that was an extra 10 points and a win that they lost last week due to RCR’s rule violations.